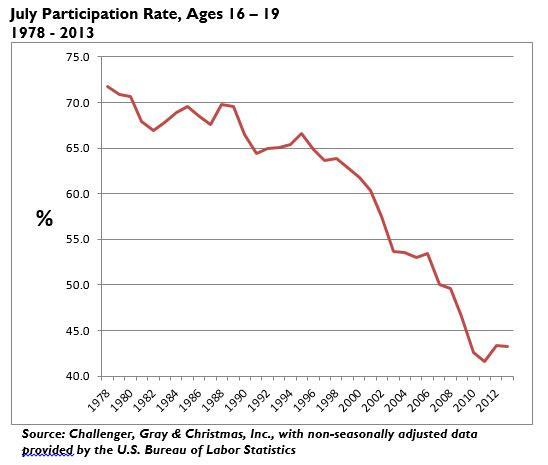 However, a new analysis of labor data released Tuesday by global outplacement consultancy Challenger, Gray & Christmas, Inc. found that the largest decline in participation has occurred among 16- to 19-year-olds. While some teenagers are certainly frustrated, the fact is that the vast majority are not seeking a job because they do not want a job. The overall participation rate, which represents the percentage of the civilian non-institutional population that is either employed or actively seeking employment, has indeed been on the decline since the onset of the Great Recession in December 2007. Prior to the recession, the participation rate peaked at 66.8 percent in July 2007. Despite steady monthly job gains since early 2010, the participation rate has continued to fall. The latest reading from the Bureau of Labor Statistics (BLS), pegged the participation rate at 62.5 percent. That is not the lowest on record, which was 57.2 percent in January 1948, but it is the lowest since April 1978, when it was 62.4 percent. A closer look at unpublished, non-seasonally adjusted data provided by the BLS reveals that the overall average is significantly skewed by a significant decline in labor force participation among those under 25-years-old, with the biggest drop occurring among 16- to 19-year-olds, whose participation rate has dropped 43 percent from a pre-recession peak of 53.5 percent to a current level of 30.4 percent, the lowest on record for this age group. Those in their early 20s (20-24) have also experienced a drop in labor force participation, but by a much smaller margin, falling 11 percent from a pre-recession high of 78.1 percent to 69.5 percent in January. Meanwhile, participation rates for age groups 25 and older have fallen by an average of just 3.1 percent from their respective pre-recession peaks. In fact, the latest participation rate for these groups remain well above the record lows, most of which occurred in 1948. For example, the participation rate for 25- to 34-year-olds in January was 81.1 percent, just 2.4 percentage points below the previous peak of 83.5 percent, recorded in August 2008. The lowest participation rate on record for this group was 61.7 percent in January 1948. Meanwhile, the highest participation rate for this age group occurred in November 1999, when it reached 85.2 percent. In other words, the latest participation rate is less than 5 percent below the record high. The participation rate for 16- to -19-year-olds, which tends to peak during the summer recess from school, reached a record high of 71.8 percent in July 1978. It has basically been falling ever since. Even during the high-flying dot.com boom of the late 1990s, when the national unemployment rate hovered around 4 percent, the participation rate among teens had slipped to around 62 percent. While teenagers have experienced the precipitous drop in labor force participation, the decline is not entirely due to economic factors, as evidenced by the fact that participation continued to decline, even during periods of strong expansion. One need only to look at the latest 20.7 percent unemployment rate for teens to see that it certainly is not easy for the youngest job seekers to find employment in today’s market. They are indeed competing for jobs with recent college graduates, seniors supplementing their retirement income, and those re-entering the workforce after raising a family. However, the record low 30.4 percent participation rate in January is not the result of a lack of jobs. While, some teens have dropped out of the labor force due to discouragement, this group represents a tiny portion of the rising number of 16- to 19-year-olds abandoning the labor force by choice. According to the BLS January household survey – the same survey used to determine the unemployment rate – there were 11.6 million 16- to -19-year-olds who were not in the labor force. Of those, only 965,000 or about 8.3 percent said they want a job. In contrast, of the 7.9 million 25- to 34-year-olds not in the labor force, nearly 1.3 million or about 16 percent said they want a job. Among the 965,000 teenagers who want a job, only 79,000 indicated that they were discouraged. That is roughly 8 percent of those who want a job and less than 1 percent of the total 11.6 million teens not in the labor force. These figures vary somewhat in the summer months when more teens want to and are available to work. Last July, of the 9.5 million teens not in the labor force, about 1.3 million or 13 percent wanted a job. Even with the summer spike in the number of teens wanting jobs, the annual average has remained relatively flat over the last two decades. Meanwhile, the number of 16- to 19-year-olds not wanting a job has increased steadily since 1994, almost in perfect lockstep with the number of people in that age group who are opting out of the labor force. 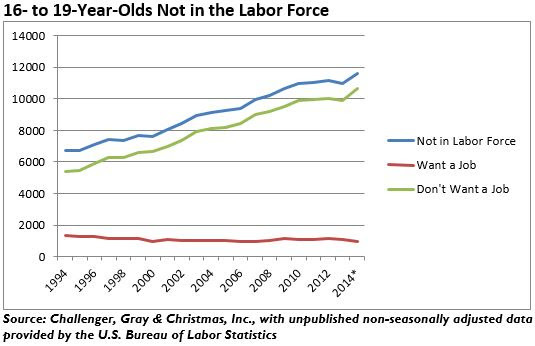 “Labor force participation has indeed fallen to alarming lows since the recession, but when you remove teenagers from the equation, the figures are not nearly as striking. This is not meant to diminish the struggle that many teens have in finding employment. However, it is important to realize that over the last twenty years, there has been a dramatic change in how teens prioritize their lives, and employment no longer plays as important a role,” said John A. 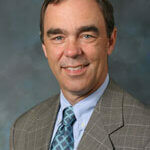 Challenger, chief executive officer of Challenger, Gray & Christmas. “It is not that these teens are lazy. In fact, it is quite the opposite. They are spending more time on homework. More of them are involved in more extracurricular activities, to the extent that some parents are worried that their children are over-scheduled. About 4.6 million teens spend time volunteering, with nearly 40 percent averaging an hour or longer per week on these activities throughout the year. Additionally, more teens than ever are attending summer school. All of these factors take away from time that used to be spent in a traditional job,” he added. A Bureau of Labor Statistics study shows that more teens are indeed attending summer school. In the summer of 2009, more than half (53.0 percent) of teens aged 16 to 19 years were enrolled in school sometime, a percentage close to 3 times higher than it was in 1989 (19.4 percent). While 2009 represents the latest available year for which data is available, the upward trend over the 20-year period suggests that summer school enrollment may be even higher now. Meanwhile, during the regular school year, kids who doing homework outside of school spent an average of 6.8 hours per week on it, according to a 2007 study by the National Center of Educational Statistics. In addition to heavier academic loads, participation in high school sports continues to expand. In the 2012-13 school year, the number of high school sports participants reached an all-time high of 7.7 million, according to data from the National Federation of State High School Associations. “Between homework, academic clubs, sports teams and other activities, many of which are aimed at gaining a competitive edge in college admissions, there is little time left for traditional employment. This is not to say that many teens are not earning spending money in some manner or another. Whether it is through household chores, odd jobs around the neighborhood or through other entrepreneurial activities, teens are able to obtain walking-around-money and perhaps establish some savings. “While high school students and young college students are probably not sitting around doing a cost-benefit analysis of how best to spend their time, it is easy to understand how a young person weighing his or her options would conclude that sports, clubs and summer school are more likely to pay better dividends over the long run, compared to a minimum wage job in fast food,” Challenger concluded.